Juan Ponce de Leon was a Spanish explorer and nobleman who also became the first Governor of Puerto Rico under the Spanish Empire. He was the first European to reach Florida (now in USA) which was also the initial exploration of mainland USA (area south of Canada and north of Mexico). Juan Ponce was born in 1474 in the now Spanish province of Valladolid. In his young age, he took part in the fights against the Muslims rule of Granada for the re-conquest of Spain. The re-conquest of Spain completed in 1492 and the chance of military expedition in Spain ended for Juan Ponce. Then, he decided to went abroad to test his luck along with other people of that time. He joined Christopher Columbus for his second voyage to the new world in 1493 along with 1200 men. Their fleet reached the final destination of Caribbean island of Hispaniola (now Dominican Republic and Haiti) after visiting several other islands. The Tainos (indigenous people of Hispaniola and other Caribbean areas) were very rebellious and Juan was given the responsibility to maintain peace in the region in 1504. He did so after a massacre in Higuey (eastern most Hispaniola) and he was later appointed as the frontier Governor of this newly-conquered province. In 1508, he took an expedition to modern day Puerto Rico after the permission by Spanish king in order to find gold. The mission was quite successful but he had to come back after few months along his companions due to shortage of food and other commodities. 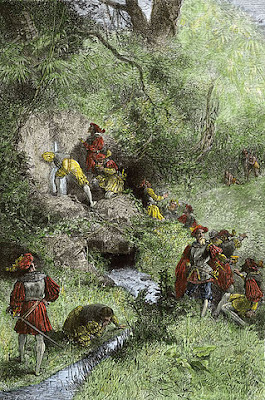 Later in 1509, Ponce was appointed governor of San Juan Bautista (now capital of Puerto Rico) and he continued his efforts of gold exploration in the area. 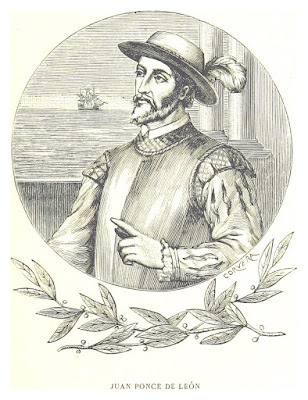 In 1511, Juan Ponce was replaced by Juan Ceron as governor after a long political and legal battle by Diego Colon (son of Christopher Columbus), who was made Viceroy of Spanish West Indies on the orders of court in July 1509. In 1511, there were rumors in Spain about the undiscovered islands northwest of Hispaniola. Spanish king Ferdinand was eager to discover this area for Spain. Ferdinand wanted to reward Ponce for his services and made a contract with him in 1512. According to this contract, Juan Ponce was given special rights to discover the islands of Benimy and its neighboring islands for next three years and he would be governor of these new islands for his whole life. In March 1513, Ponce set out with 200 men and three ships from Puerto Rico. On 27th March, they reached an island Great Abaco (northern Bahamas). On 2nd April 1513, Ponce and his men arrived at another island which he named La Florida (land of flowers) as the flowers were blooming of flowers there. There the Spanish face clash against the Calusa Native Americans and they lost few of their men in several skirmishes. Later they sailed to the south-west of Florida and reached the Dry Tortugas islands on 21st June. Later they reached Grand Bahama on 8th July while Ponce arrived at Puerto Rico on 19th October 1513. According to a legend, the discovery of Florida by Juan Ponce was not only for gold and expansion of Spanish Empire but another important reason for this discovery was the pursuit of Fountain of Youth. It was an imaginary fountain about which there were stories that its water restores the youth of an old person. Juan Ponce was also getting old and wanted to bring back his passing youth. Though, there was no such fountain in reality but Juan Ponce achieved the real task i.e. discovery of the Continental USA for the Europeans.